Context - Demand for water in the world is steadily increasing at the same time as the water supply is facing challenges from pollution, climate change, desertification, agriculture. Can these challenges be met with solutions inspired by natural processes? This is a faithful summary of the leading report produced in 2018 by UN Water: "United Nations World Water Development Report 2018, Nature-based Solutions for Water "
The United Nations World Water Development Report, nature-based solutions for Water, launched in March 2018 during the 8th World Water Forum, and in conjunction to the World Water Day, demonstrates how nature‐based solutions offer a vital means of moving beyond business‐as‐usual to address many of the world’s water challenges while simultaneously delivering additional benefits vital to all aspects of sustainable development. 2. What are nature-based solutions for water resources management? Nature-based solutions for water resources management are inspired and supported by nature and use, or mimic, natural processes to contribute to the improved management of water. They can be applied at a small scale, for instance in the case of a dry toilet, or at a large scale, where whole landscapes are concerned. These green infrastructures use natural or semi- natural systems such as wetlands to provide water resources management options with benefits that are equivalent or similar to conventional grey (built/physical) water infrastructure. A key feature of nature-based solutions is that they tend to deliver groups of ecosystem services together – even if only one is being targeted by the intervention. These solutions show particular promise in achieving progress towards sustainable food production, improved human settlements, access to water supply and sanitation services, and water-related disaster risk reduction. They can also help alleviating the impacts of climate change on water resources. However, there are still many cases where water resources policy and management ignore nature-based options – even where they are obvious and proven to be efficient. 3. What is the state of the world’s water resources? The global demand for water has been increasing at a rate of about 1% per year and will continue to grow significantly over the next two decades. The vast majority of the growing demand for water will occur in countries with developing or emerging economies. At the same time, the global water cycle is intensifying due to climate change, with wetter regions generally becoming wetter and drier regions becoming even drier. Water pollution has also worsened in almost all rivers in Africa, Asia and Latin America and the deterioration of water quality is expected to further escalate over the next decades. 4. What is the role of ecosystems in the water cycle? Ecological processes influence the quality of water and the way it moves through a system, as well as soil formation, erosion, and sediment transport and deposition – all of which can exert major influences on hydrology. Ecosystems have important influences on precipitation recycling from local to continental scales. Rather than being regarded as a ‘consumer’ of water, vegetation could be, perhaps more appropriately, viewed as a water ‘recycler’1. 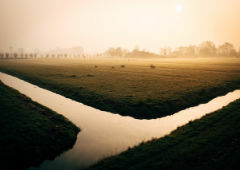 Land use decisions in one place may therefore have significant consequences for water resources, people, the economy and the environment in distant locations – pointing to the limitations of the watershed (as opposed to the ‘precipitation shed’) as the basis for management of these resources. Ecosystem degradation is also a leading cause of increasing water resources management challenges. Since the year 1900, an estimated 64–71% of the natural wetland area worldwide has been lost due to human activity. All these changes have had major negative impacts on hydrology, from local to regional and global scales. There is evidence that over the course of history, such ecosystem changes have contributed to the demise of several ancient civilizations. A pertinent question nowadays is whether we can avoid the same fate. 5. What are the so-called “nature-based solutions” for water availability? Nature-based solutions mainly address water supply through managing precipitation, humidity, and water storage, infiltration and transmission, so that improvements are made in the location, timing and quantity of water available for human needs. For instance, as an alternative to building dams and creating reservoirs, more ecosystem-friendly forms of water storage, such as natural wetlands, improvements in soil moisture and more efficient recharge of groundwater, could be more sustainable and cost-effective. Agriculture will need to meet projected increases in food demand and water is central to this need. ‘Conservation agriculture’ is a flagship example approach to sustainable production intensification. Nature-based solutions for addressing water availability in urban settlements are also of great importance, given that the majority of the world’s population is now living in cities. Urban green infrastructure, including green buildings, is an emerging phenomenon that is establishing new benchmarks and technical standards that embrace many nature-based solutions. 6. How can nature-based solutions improve water quality? Source water protection reduces water treatment costs for urban suppliers and contributes to improved access to safe drinking water in rural communities. Forests, wetlands and grasslands, as well as soils and crops, when managed properly, play important roles in regulating water quality by reducing sediment loadings, capturing and retaining pollutants, and recycling nutrients. Where water becomes polluted, both constructed and natural ecosystems can help improve water quality. Urban green infrastructure is increasingly being used to manage and reduce pollution from urban runoff. Examples include green walls, roof gardens and vegetated infiltration or drainage basins to support wastewater treatment and reduce storm water runoff. 7. How can water-related risks be mitigated with nature-based solutions? Water-related risks and disasters, such as floods and droughts, result in immense and growing human and economic losses globally. Green infrastructure can perform significant risk reduction functions as combining green and grey infrastructure approaches can lead to cost savings and greatly improved overall risk reduction. 8. What are the challenges and limitations of nature-based solutions for water resources management? There remains a historical inertia against them due to the continuing overwhelming dominance of built (or “grey”) infrastructure solutions. This dominance can exist in civil engineering, market-based economic instruments, the expertise of service providers, and consequentially in the minds of policy makers and the general public. Nature-based solutions often require cooperation among multiple institutions and stakeholders, something that can be difficult to achieve. There is a lack of awareness, communication and knowledge at all levels, as well as a lack of technical guidance. The hydrological functions of natural ecosystems, like wetlands and floodplains, are much less understood than those provided by grey infrastructure. 9. What are the conditions needed so that nature-based solutions for water resources management can flourish? 10. What are the synergies with the United Nations Sustainable Development Goals (SDGs) that would allow to move forward? Nature-based solutions are able to enhance overall water security by improving water availability and water quality while simultaneously reducing water-related risks and generating additional social, economic and environmental co-benefits. These solutions offer high potential to contribute to the achievement of most of the targets of the 17 Sustainable Development Goals (SDGs) set up by the United Nations, in particular SDG 6 on water and also on the goals that are linked to sustainable agriculture (SDG 2), health lives (SDG 3), building resilient (water-related) infrastructure (SDG 9), sustainable urban settlements (SDG 11) and disaster risk reduction (SDG 11 and, as related to climate change, SDG 13) as well as on the reduction of land use pressures on coastal areas and the oceans (SDG 14) and the protection of ecosystems and biodiversity (SDG 15). 11. What conclusions can be made of this evaluation of the potential of nature-based solutions for water management? The increased deployment of the water resources-related SDGs is central to meeting the key contemporary water resources management challenges of sustaining and improving water availability and quality, while reducing water-related risks. The inadequate recognition of ecosystems’ roles in water management reinforces the need for transformational change, and increased uptake of nature based solutions provides a means to achieve it. Without a more rapid uptake of such solutions, water security will continue to decline, and probably rapidly so. Nature-based solutions are indeed able to enhance overall water security and generate win-win outcomes across social, economic and environmental sectors. Some other areas where the co-benefits of nature-based solutions deliver particularly high rewards in terms of achieving the SDGs include agriculture and energy, inclusive and sustainable economic growth, full and productive employment and decent work for all. The objective needs to be to minimize costs and risks, and maximize system returns and robustness, while providing optimal ‘fit-for-use’ performance. A role of policy should be to enable the right site-level decisions to be taken in these regards. If a good, although somewhat belated, start in this process has been made, there is still a long way yet to go.